Salary Survey: If you got a big raise last year, consider yourself lucky. As indicated by the 2018 PRWeek/Bloom, Gross & Associates Salary Survey, pay bumps are still common, but not near 2017 levels. Instead, employers are focusing more on tech, training, and reorganization to boost workforce productivity. 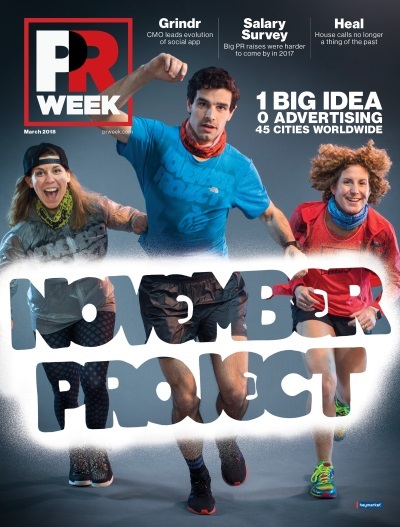 November Project: From humble beginnings in a Boston bar, November Project has transformed into a worldwide phenomenon led by its two founders, who have spread the workout-crazed group to 45 cities across the globe. Newsmaker: WeWork’s Jennifer Skyler has come a long way since being the startup darling’s first comms executive hired, but now with a team of 50 staffers, her work is far from finished. Everyone Gets the Message: Industry leaders from Incyte, Pfizer, Cien+, Edelman, Bayer, Deloitte Digital, Weber Shandwick, and Cleveland Clinic met for this Bayer-hosted panel in Washington, DC, to discuss philosophies for shepherding stakeholders through the opioid epidemic and the U.S.’ shifting demographics. CMO Feature: Grindr CMO Peter Sloterdyk listened to the app’s users, then set out to help them discover, connect with, and navigate the world around them. CEO Feature: Heal CEO Nick Desai aims to improve the patient experience by providing an on-demand service that cuts time and costs while increasing human interaction.